Friday was Purple Day around Meigs County as individuals wore purple in recognition of Domestic Violence Awareness Month. Pictured are (front from left) Victim Advocate Shelley Kemper, Victim Advocate Alexis Schwab, Commissioner Clerk April Burnem; (back, from left) Commissioners Randy Smith, Mike Bartrum and Tim Ihle and Prosecutor James K. Stanley. 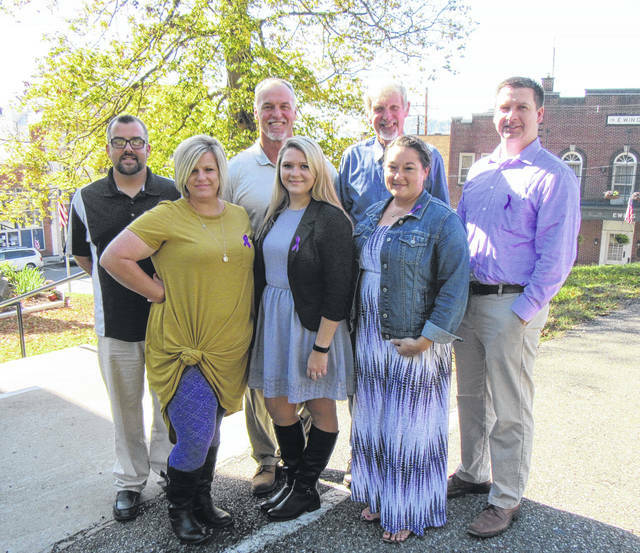 POMEROY — The Meigs County Commissioners officially recognized October as Domestic Violence Awareness Month during their meeting on Friday, which was also the day set aside to wear purple for domestic violence awareness. Meigs Victim Assistance Office advocates Shelley Kemper and Alexis Schwab were present at the meeting, with Schwab presenting statistics and information on domestic violence. During their lifetime, one in four women will experience domestic violence, Schwab told the commissioners. An estimated 1.3 million women are victims of physical assault by an intimate partner each year, with females who are 20-24 years of age are at the greatest risk of non-fatal intimate partner violence. The majority of cases of domestic violence are never reported to law enforcement. In other business, the commissioners commended Department of Job and Family Services for a “perfect” audit report with no findings. Kathy Brown, an attorney who as represented local residents in C8 cases, spoke to the commissioners about the possibility of filing a lawsuit against pharmaceutical companies and distributors regarding the opioid epidemic. Numerous other counties, along with the Ohio Attorney General’s Office, have already filed cases. The commissioners advised that they would speak with Prosecutor James K. Stanley before making any decisions regarding a potential case. The annual allocation of $8,000 for the Meigs County Council on Aging was approved as requested. The funds are used as a match for other funding. Bills were paid in the amount of $375,318.22, with $15,540.09 from the county general fund. A lease was approved with Ray Karr for a small piece of property which connects to his property off of Wesam Road in the Five Points area. According to the agreement, Karr intends to put a memorial on the property. Commissioner Tim Ihle explained that the property, which is of no use to the county, is covered in brush which will be cleared by Karr as part of the agreement. The replacement of the remaining windows in the courthouse and some windows at the prosecutor’s office were discussed. A contract is to be presented in the future to the commissioners for approval of the project. Windows on the third floor have previously been replaced. The commissioners meet each Thursday at 11 a.m. unless otherwise stated. https://www.mydailytribune.com/wp-content/uploads/sites/42/2017/10/web1_10.22-COmmissioners-go-purple20171020164018949.jpgFriday was Purple Day around Meigs County as individuals wore purple in recognition of Domestic Violence Awareness Month. Pictured are (front from left) Victim Advocate Shelley Kemper, Victim Advocate Alexis Schwab, Commissioner Clerk April Burnem; (back, from left) Commissioners Randy Smith, Mike Bartrum and Tim Ihle and Prosecutor James K. Stanley.